eBay's new TV commercial is running with the theme, "If it's happening in the world, it's happening on eBay" and features a new song "Love you so" by the artist bleu. It's an improvement from previous plain "color your cart" eBay ads. The "color you cart" theme is not memorable because it doesn't really mean anything to shoppers, it was eBay trying to take a shot at Amazon's beige packages. When it launched the color your cart campaign in June 2017, eBay said the theme was designed to "celebrate personal expression and individuality, establishing eBay as THE place to find unique items." 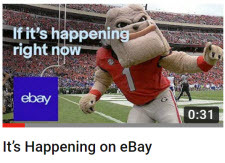 eBay's new "If it's happening" theme is more relatable, though you'll see the ads still end with the color your cart tagline. eBay introduced the new ad today on social media channels including on Instagram, where it posted, "From fashion week to game day, if it's happening in the world, it's #happeningonEbay." eBay explained, "The diverse experience that our customers have on eBay is very different from any other commerce experience. We feel in many ways that eBay is part of what shapes our society and the world we live in. And this is exactly what we're celebrating with our new marketing campaign, which we are debuting this week. Our new television and digital creative highlights what we've known all along: Everything that's relevant, interesting and current is on eBay - and you can buy it now." Sellers have been waiting for eBay to recognize the fact that the inventory they sell on its marketplace is different, and the new commercial tries to capture that sense, though it focuses on current trends and new, commodity items. In reality, people also go to eBay hungry to feed their appetite for nostalgic pop culture as well. eBay also breaks out those themes into separate ads, one each for fashion, movies, and sports. You can see all four ads and eBay's introduction in on the company's corporate blog post. Its easier to get more excited over a boring movie than anything Fleecebag dreams up in the way of some umimportant ad on TV. The only thing happening on Ebay is sellers are leaving and the thieves and scammers are taking over. Better to buy elsewhere without the hassle. THIS IS SO STUPID ! Ebay was Engineered for one thing, AND ONE THING ONLY. TREASURES FROM THE PAST ! ! YOU CAN'T GET THEM ANY WHERE ELSE ! ! ! The snotty morons "running" AKA RUINING Ebay now are, apparently, EMBARRASSED by Our treasures. Our treasures aren't GOOD ENOUGH for 'em. SNOTTY BASTARDS ! ! ! Well THAT'S FINE. GO OUT OF BUSINESS FOR ALL WE CARE. You IDIOTS deserve it. NOW GIVE ME A THROAT LOZENGE. EBAY HASN'T BEEN "RELATABLE" IN OVER TEN YEARS ! ! ! AND THEY STILL AREN'T ! ! GIMME THE WHEEL DAMN IT ! ! ! Seriously, show Devin the door and put me in. I can be there in 6 hours. "We're about uniqueness and diversity"
"Help us change over to the catalog shopping experience"
They don't have anything, no merchandise, no IT people, no buyers, no bandwidth, no competence or coherent vision which would have saved them back when they still had people using their site. They have hydrogen atoms and slogans. Mega-Idiots. They don't know what dribble to push this week or next. I suppose that 3Q press call is coming soon. Ergo...if you're over 25, you have no place in an ebay focus group. So I wonder...where DO all those people over 40 spend their money? You know...the ones with LOTS of it. "[E]stablishing eBay as THE place to find unique items." That's funny, since they seem to want all small sellers of the rare and unusual to leave the site. "If it's happenting in the world" is the most ludicrous lead-in phrase they could have imagined. Birth, death, fire, hurricanes, starvation, drought, etc are all "happening"...not to earthquakes and mudslides. Did some pimple-faced goony at ebay who doesn't own a suit wake up one morning and heard from his TV "if it's happening in the world, we're there to report it", and decided to immortalize the 1st part as a catch phrase? ...no matter how dumb what followed? Devin missed the Love Boat of Differentiation a long time ago when he started copying everything that Amazon does, he must have got an Amazon Seller Account so he could develop his replatforming program for eBay. It seems that the marketing department of eBay is on a different plane than Devin is, that or they know he is going to be fired soon. Everybody knows it but him. ...they shop to SAVE money. People shop Amazon for speedy & free shipping and will take a decent price. ebay sellers for the most part can't combine speedy delivery (high cost), free shipping, AND get a decent margin. Have you noticed that as companies get bigger and closer to monopoly status, they treat their customers much worse, and get away with stealing? You are not imagining it. Cable companies throttle to band width down and want to charge you more, they bill you for a 13 month year, insurance companies and health care is a nightmare, and don't even bring up the airline industry. People with put up with incredible levels of abuse, especially if there is no competition. This Ebay may not be a regular business. This may be a huge experiment, like the housing bubble in 2008. They made Trillions on that one too. These guys may not be as dumb as you think. They may be in the process of finding out just how much customers and employees will put up with before they head out the door. This data is crucial to big industry, why waste money on customer service and quality if the people will put up with less? Let's find out how much less. The really good part is that they can make billions while running this experiment, just like ACORN and the big banks did in 2008. Luckily, taxpayers won't have to bail these goons out. But watch this, you'll see it again. The idea of treating the customer with respect is being replaced with massive monoplies which fly through Congress and ensure the evolving hybridized Socialist Oligarchy where nobody can tell where Corporate America ends and government begins. One thing we can probably all agree on, The customer, and the middle class are seeing their rights go up in a puff of smoke. Raise your hands if you believe that eBay sells 365 Ferraris PER YEAR ... I know I dont. Ferrari makes just over 7000 cars per year for the entire world. . . It's OK - I can't unsee that giant tongue but I think they're trying so good for them. Any advertising is better than none. Anything that tends to make potential shoppers think about eBay is helpful. I've seen some folks say they would never use eBay tape and stickers on their packages because ''I'm not gonna give eBay free advertising.'' Now that is very short-sighted. Anything that encourages folks to think eBay when they want something helps all sellers, helps you, helps me. Seems like some people would rather not sell anything at all if eBay might also benefit from the sale. If you are an eBay seller, what do you think? If you are not, no comment is necessary. Ebay has pushed unique items off the site in favor of amazon reselling. All recent changes, fee increases, policies, and updates have made it harder to sell premium unique goods leaving behind sellers of dumpster dive finds and reselling items from some third parties inventory. Standard business models and on hand inventory type businesses are hard to keep up in this new volatile climate. Not that anyone at ebay would recognize this of course.....The most experienced seller on staff is Griff selling his used clothing. Maybe we need more from ebay thing bigger return buttons everywhere and a few TV ads.......? All those non store sellers that the 10% fees pushed away were the bringers of unique products and most found it acceptable to "take what they could get" at auction because they were only selling their stuff and not trying to be "in business". When the choice of despising of your baseball card or rare comic ebay was always a better deal then the haircut you got at the pawnshop or dealer.....But 10% fee, 3% pp fee, shipping fee, return risk, return label fees and epic headaches just makes it easier to go to the dealer and get your haircut. "If it's happening in the world, it's happening on eBay"
Are the referring to instability and chaos? If so, they nailed it.